These delicious peanut butter chocolate chip shortbread cookies combine the best of three worlds – chocolate chip cookies, peanut butter cookies and shortbread – into one delicious treat. 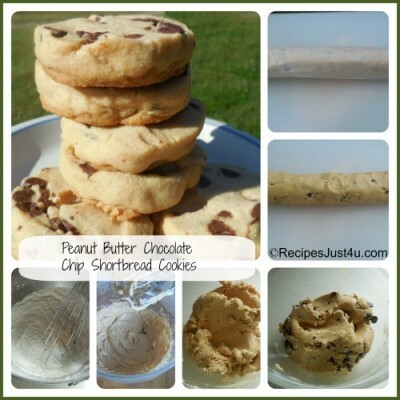 Printable Recipe: Peanut Butter Chocolate Chip Shortbread Cookies. The cookies are easy to make. You just combine the dough into logs and refrigerate for a while and then slice and bake. You can make as many or as few as you like at one time. Just keep the dough covered and refrigerated until ready to use. And that is the beauty of these! Once you have the dough made, you are 12 minutes away from a delicious sweet treat. 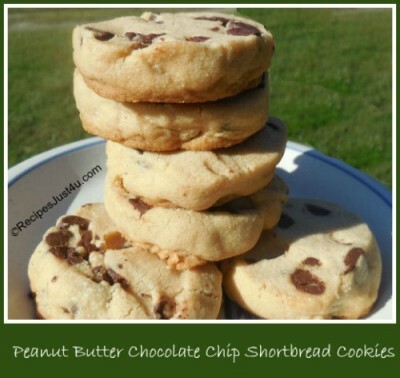 These melt in your mouth shortbread cookies take it up a notch with the addition of both peanut butter and chocolate chips. Cream the butter and the peanut butter together and then add in the vanilla extract. Whisk together the dry ingredients until combined and add them to the butter mixture. Mix well until the dough comes together. Stir in the chocolate chips, and then place the dough out onto a piece of waxed paper. Form the dough it into a long log. Work it until it holds together well. Roll the dough up in the wax paper. twist the ends securely and refrigerate for a couple of hours. Slice the log into slices with a sharp knife, about 1/3 inch. Bake on a parchment lined baking sheet at 325º F for about 12-14 minutes. Don't over cook the cookies. They will not be browned the way normal cookies are. That is the way short breads cookies should be. Let the cookies cool on the pan for 5 minutes before transferring to a wire rack.